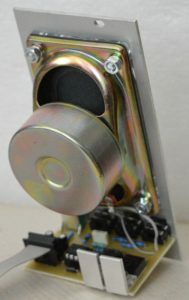 S-510 Speaker w. amp module for eurorack/Doepfer A100 system. Two inputs (equally mixed), input 2 is hardwired to mult2 (output), volume knob. Kindly insert module only when rack is switched off, heatsinks and its screws at bottom side are at +-12V power supplies thus your power supply can be easily shorted!